The Supreme Court on Tuesday held that NOTA (none of the above) option cannot be allowed in Rajya Sabha elections, opining that while the option may serve as an “elixir” in direct elections, it would “not only undermine the purity of democracy but also serve the Satan of defection and corruption” if allowed in elections to the Council of States. The Court was hearing a petition filed by Congress Chief whip Shailesh Manubhai Parmar, challenging the circulars issued by the Election Commission of India introducing NOTA in Rajya Sabha elections. Mr. Parmar had challenged this as being contrary to Article 80(4) of the Constitution of India and the Apex Court decision in the case of People’s Union for Civil Liberties and another v. Union of India and another. Article 80(4) provides that members of Rajya Sabha shall be elected by the elected members of State Legislative Assemblies through the system of proportional representation by means of the single transferable vote. In the PUCL case, the Apex Court had held that voters must be given an opportunity to choose the NOTA option, opining that this would compel political parties to nominate sound candidates of integrity. Mr. Parmar had also alleged violation of the Representation of People Act, 1951 and the Conduct of Election Rules, 1961. The ECI, on the other hand, had relied on the PUCL judgment to assert that there exists no distinction between direct and indirect elections and, hence, the provision of NOTA in the ballot paper of the elections has been made available to effectuate the right of electors. It had further submitted that even though there is no need for secrecy in Rajya Sabha elections, this does not take away the right of the elector to not vote by opting for NOTA option. Examining the judgment in the PUCL case, the Court noted that it pertained to Parliament and State Legislative Assemblies. It asserted that the decision laid emphasis on universal adult suffrage conferred on the citizens of India by the Constitution and the entitlement of a voter to come to the polling booth and decide to vote for any candidate or to exercise the right not to vote. A distinction, it said, has been made between direct and indirect elections therein. Highlighting this distinction, the Court opined that introduction of NOTA will have a “negative impact”, noting that the secrecy of voting has no room in the voting process of the Council of States and that the discipline of the political party/party members matters in such elections. 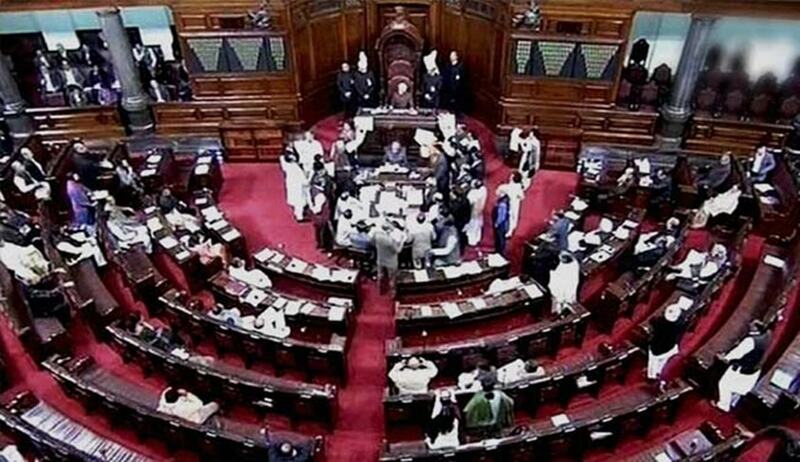 The Court further asserted that if NOTA is allowed in Rajya Sabha elections, “the prohibited aspect of defection would indirectly usher in with immense vigour”. It finally opined that the option would not withstand the scrutiny of the "cosmos of concreteness”, borrowing the expressing from Justice Krishna Iyer, more so when the elector’s vote has value and the value of the vote is transferrable. “We may immediately add that the option of NOTA may serve as an elixir in direct elections but in respect of the election to the Council of States which is a different one as discussed above, it would not only undermine the purity of democracy but also serve the Satan of defection and corruption,” it added. The Court therefore allowed the petition, quashing the impugned circulars issued by the ECI.